I am a Christian. I love God. I breed, raise, and show English Cocker Spaniels. I love dogs. I read a book recently titled "Lessons from a Sheep Dog" by Phillip Keller. Awesome book. It's a story of a man and a sheep dog who learn together what it means to be loved and the joy that comes from becoming all and fulfilling all that God made you and designed you to be. Keller's book made me reflect on my own relationship with God. It made me reflect on God's goodness toward me, His love toward me, and His wisdom in guiding my life. I started to think about how blessed I was to have a GOOD Master. I then started thinking about my 16 years raising English Cocker Spaniels and about all the dogs who have shared my home. It may seem obvious, but no two dogs are exactly alike in personality and/or intelligence. To all the dogs, though, I am Master. I am not a perfect Master, but I try to learn from my mistakes along the way. Thinking again about my Good Master (God), I asked myself what specifically motivated me to want to be "good"? I then thought about my dogs and as their Master, what was it that motivatedthem to want to be "good"? Looking upward, how do I view God and how do my dogs view me? Looking downward, how does God view me and how do I view my dogs? The word I got in my heart was this: Good Master, Good Dog. I will be sharing here real life stories of my life with my dogs and the truths about God they have taught me along our journey together. I love my dogs and want nothing but the best for them. They are entrusted to my care by God Himself. I am their Master. Should not my Heavenly Father feel the same toward me as my Good Master...and then some? I am certain He does. I pray you are blessed by the God-analogies shared here...and that you will grow in the love of God to the point that you cling to His every Word, revel in His goodness, overflow with joy to be in His very presence, and desire to please Him in all you do. Will you hold my paw? 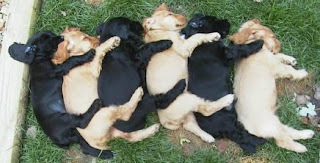 I recently had a litter of puppies whelped here – 3 girls. I named them Faith, Hope, and Charity. This was Journey’s first litter. At first, she was a bit confused and a little worried, but Journey and I have a special bond. I stuck by her and comforted her with soft words and reassuring pets on her head and belly. She watched my eyes closely and listened to my words intently…certain I would not leave her and that I would be with her to help her along the way. I was there the whole time, I did comfort her…and everything went well. Momma Journey continued on to be a wonderful mother and she cared for her precious girls so tenderly. Sometimes I think we too enter into “uncharted waters” of life, where we look around with confusion, worry, and often fear…fear of the unknown. God, our Good Master, is not too busy to notice, or to care. He’s been there already, with others and with his Son, Jesus, in the garden of Gethsemane. He doesn’t want us to experience these dark places alone. God himself promised “I will never leave you nor forsake you” (Hebrews 13:5, Deut. 31:6). In these dark places, we can look up, catch a glimpse of His glory, feel the comfort of His loving arms, and listen to the small still voice speaking softly in our ear, “I am with you always”. Somehow, someway, we make it through with His tender care and guidance….and we are able to look back and say “We did it!”. God cares, God is there…just as I cared and I was there for my Journey girl. Thank you, God, for loving us so, and for the blessing of Your wonderful presence at ALL times. I watched my young puppies play in the yard today. They bounced around joyfully while exploring their "world". They chewed on sticks, played "tag", dug holes, and yes, chased a few newly hatched 17 year cicadas (ICK!!). They had no cares or worries, they had no agenda or anywhere they had to be, they were just simply enjoying life. Watching the puppies play brought a smile to my face and joy to my heart. I looked on with pride and delighted over them with thoughts of, "Those are my kids, look how happy they are...aren't they cute??!!" We're adults now. We're all grown up. Life isn't always just fun and games in the backyard. We have responsibilities. We have places to be, people to see, and things to get done. Life is busy. Nevertheless, sometimes I think we pack life so full of "things to do" that we miss out on just simply enjoying life. Yes, God is pleased when we show ourselves responsible and hard working. But, I think sometimes He reflects back to when we were children, when we had few cares or worries, when we had no agenda or anywhere we had to be, when we marveled and played in His creation. He watched us then and we brought a smile to His face and joy to His heart. He looked on with pride and delighted over us with thoughts of "Those are my kids, look how happy they are...aren't they cute??!!" No matter how old we get, God doesn't want us to lose that childhood zeal and love of life. He doesn't want us so busy with life that we have no life. Jesus said "I came that they may have life, and have it abundantly" (John 10:10). MAKE time to enjoy the simple pleasures of life, the wonders of His glorious creation. Today I did just that. I stood on a bench and spent 20 minutes picking and eating unwashed mulberries off an old tree in the yard....just as I would have done as a child (only I would have climbed the tree instead!). I thought about my Good Master...and I have a feeling He thought about me too....and smiled, with joy in His heart. I have a mulberry tree which hangs over my back fence. The berries are now ripe and the dogs love to snack on the fallen berries. They eat for a while and then go play. They stop back later, they eat some more, and then go play. I suppose if dogs had opposable thumbs it might cross their minds to gather up a big pile and bring some in for a late night snack or store some away for another day in case I forgot to feed them their morning kibble. But alas, they seemed content to just eat what they wanted from the tree and then go off to play….without worry there might not be any more berries later. Last week I had snacked on mulberries off that tree, right there in the yard while I thought about God’s goodness and reflected on the simple joys of life. Today though, while watching the dogs eat the fallen berries, I had the grand thought of gathering and filling a BIG tasty bowl of them for myself for later. Mmmm, berries and ice cream for dinner…it’ll be so yummy! Later, when I went to wash the bowl of berries, there appeared a small spider, then another, then a little beetle looking thing, and another. I reluctantly continued washing and then tried to eat some (after all, I had worked so hard to fill that big bowl!). Nope…couldn’t do it…couldn’t get the visions of spiders and beetles out of my head. There’s something to that “daily bread” concept God so often teaches us in His Word. As master of my dogs, it is my responsibility (without burden) to give my dogs their daily kibble meals. In fact, they wake me each morning to remind me of this task! Jesus told us in Matthew 6:11 to pray to our Father, our Good Master, this prayer: “and give us this day, our daily bread”. There is nothing wrong with asking God to this day, provide mydaily bread, and then trust Him to do just that! Often though, we go far beyond this with the “more is better” mentality (like I did with the mulberries!). Or, we worry there won’t be enough for tomorrow and so we hoard. Neither is faith. "Because You have been my help, Therefore in the shadow of Your wings I will rejoice. My soul follows close behind You; Your right hand upholds me. " 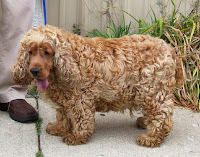 I tell anyone looking to get an English Cocker Spaniel that they should only get one if they like a dog to be their shadow. English Cockers (at least my kennel lines) follow you EVERYWHERE. If you get up from the couch, they’ll get up and follow you. If you head to the bathroom, they’ll follow you. In fact, if you close the bathroom door on them, they’ll crouch down and sniff under the door until you open it! You will never find your “Engi” much further than an arms length away at any given time. Your presence is their joy. Your presence is where they find rest, peace, pleasure, and comfort. My old “Champ” dog was like this. He could be in the deepest of sleep at my feet and if I stood up and left the room, somehow he knew my presence had left him and he awoke and sought me out. He was not “insecure”; he just delighted to be with me! He was my shadow for 15 years. My current old girl, Glory, is 14 years old and is essentially blind and mostly deaf now. Yet, even in her present condition, she knows when I am near….or not, and will seek for me if she stretches out her nose and cannot find my leg. I delight in knowing she “needs” me, and it is never a burden to care for her and help guide her and keep her safe throughout the day. She sleeps by my side each night, right where Champ slept before he passed on last year. This world and this life can often throw so much at us, so many burdens and cares and problems. Psalm 63:7 gives us hope, “Because you have been my help, therefore in the shadow of Your wings I will rejoice”. God IS our helper and rest, peace, pleasure, and comfort is available to us in the safety of the shadow of His wings. But, it is our choice to go there, to remain there. How do we do this? The next verse gives us the way, “My soul follows close behind You, Your right hand upholds me.” God doesn’t have a choke collar on us, dragging us behind Him forcing us to follow Him, any more than I had a choke collar on my Champ or Glory forcing them to follow me. My dogs purpose to follow me. Why…because my right hand upholds them. That is, my hand holds good things for them – a pet, hug, care, provision, safety, love. If we truly believed we would find these things in God’s loving presence, in the shadow of His wings, would we purpose to seek Him more earnestly? Would we purpose to follow behind Him more closely? I think we would. I want to be like an “Engi” to God….receiving His love, resting at His feet, sleeping by His side…and never farther than an arm’s length away. "Sing to the Lord, all you godly ones! Praise His holy name. For His anger lasts only a moment, but His favor lasts a lifetime! Weeping may last through the night, but joy comes with the morning." It's morning....time to let the dogs out. I'm still groggy and my body is still moving slow. Oh, but those dogs, from the young ones to the old ones....morning is an exciting time for them! Its a new day! They aren't thinking about yesterday when they got in trouble for digging holes or for tearing apart their bed. They aren't wondering if I am still mad at them. They aren't thinking about that scuffle they had with one of their siblings over the much coveted hedge hog stuffie. They aren't wondering if their brother is still mad at them or whether they should still be mad at their brother. And, they sure aren't wasting any energy thinking about whether or not it's going to rain today and mess up their "plans"! No, its morning and its a NEW day!! OK...so I know dogs don't "think" like we do...but sometimes I think we as humans can think too much!! We spend so much of our time today thinking about what happened yesterday. We think about how we disappointed someone close to us, or how they disappointed us. We think about that argument we had with our parent, our spouse, our friend, or our boss. Are they still mad at me? Am I, or should I, still be mad at them? I WAS right, you know. Is God still mad at me for when I blew it yesterday and acted "ugly", or for that fill-in-the-blank thing I did 10 years ago? The Psalm here says God's anger lasts for a moment. Wow. He's GOD and even HE only lets his anger last a moment with us. If God can "forgive and forget" in a moment, why do we carry for days or weeks or years that "grudge" and that unforgiving heart toward that person who "wronged" us? Or, worse, toward God because things didn't go the way we thought they should and HE didn't seem to care (or so we thought). God does not dwell on the past, and He doesn't live in the past. He lives today, with the forward looking attitude toward us of "His favor lasts a lifetime". He gives us a NEW day, each day, to live in His favor. We may weep for the night, but as my little cockers know full well, "joy comes with the morning".....if we choose to let it, and live in it. Over the years I have had many people watch my dogs interact with me and then comment, “Look how much they adore you!”, to which I'd reply, jokingly, “Oh yes, they worship me!”. Little did I realize how much this casual comment would later teach me. My husband recently shared with me the definition of the Bible’s Greek word for “worship”. The first definition listed in Strong’s Exhaustive Concordance for the word “worship” is this: to kiss, as a dog licking his master’s hand. Oh my!! I immediately thought of my dogs and all their licking. They really DO worship me!! And, they are not content with just a lick of the hand, but they must get to my face too! As I thought more about this newly discovered definition of worship, I began to ask myself the question: Why DO my dogs insist on licking me? I believe my dogs lick me, first and foremost, as an act of reverence. My dogs think I am GREAT! Not great as in “she’s really cool”, but great as in all powerful, all wonderful, all mighty, allmagnificent. There is no one and no thing bigger in their eyes than me. I also believe my dogs lick me out of a heart of thanksgiving for who I am to them – their provider, their protector, their good master. I suppose some would say all this “worship” could make one into an egomaniac. I have to be honest, it does feel good to know the love I have given has been accepted…and reciprocated, even through their simple expression of “worship”, the licking of my hand. John 4:23 says GOD is seeking true worshipers to worship Him. Arewe “worshipers”? What kind of “worship” do we give our Good Master? Do we “drive through” once a week, wave hello from a distance, sing a quick song, recite a few memorized prayers, eat a cracker, and tell him on our rush out, “See ya next week!”? Or, if we do actually make time to approach Him, do we stay only long enough to dump our problems so we can hurry off to make more? Do we really believe He is bigger than our problems anyway? What if we really did start to see Him and experience Him for who He truly is and who He wants to be in our life? What if we made the time to sit at His feet and simply awe at the GREATNESS of His power, His wonder, His might, and His magnificence? Can our heart purpose to be thankful for all He is to us - our provider, our protector, our good and loving Master? Do we approach His hand with boldness and confidence and trust, or do we approach His hand as a dog approaches the hand of a stranger, cautious and distrusting? Lord, let us purpose to know you as our GOOD Master today. Let us purpose to magnify you in all Your majesty and splendor, for you truly are GREAT. Let us let you love us more deeply, to the point we reciprocate that love back to you, and on to others. Lord, we desire to become the true worshipers you seek, sitting adoringly at your feet…..and taking every opportunity to kiss our master’s hand. The most frequently asked question when non-doggy people come to our house and see all my English Cocker Spaniel dogs and/or puppies is, “HOW do you tell them all apart??!!!”. I find this such an odd question because they all look different to me! I can tell you which one is a bit more “stocky”, which one is a slightly different shade of color than the next, which one has rounder eyes than the next, which one has a certain spot of white on the chest, which one has a swirl in the hair on the shoulder…I could go on and on. Beyond appearances, I can also tell you which one is shy, which one is bold, which one is silly, and which one “thinks too much”. Though they were made in the image of their sire and dam, they are each uniquely beautiful and special to me. God tells us “the very hairs on your head are all numbered”. Wow. I have never gotten to the point of numbering the fur on my dogs! All of mankind and all the wondrous diversity, yet God knows each of us down to the very hairs on our head. Sometimes we can feel so insignificant and irrelevant in life, like if we disappeared perhaps nobody would notice. My friend, God would notice. He knows not just our outward appearance, but the very thoughts and secrets of our heart (Hebrews 4:12). He knows our fears, our insecurities, and our weaknesses. But, He also knows our gifts, our talents, and our strengths. We are not insignificant to God. We are valuable to Him - more than a “flock of sparrows” and more than even a herd of happy, wiggly tailed English Cockers! We are uniquely beautiful, made in His image, and individually crafted….so that collectively, God can masterfully paint Himself a magnificent canvas of the glorious “body of Christ”. Recognize your beauty to God, value your purpose for His purpose. Let God use you to “color His world". I have a one year old English Cocker Spaniel named “Groovy”. She is a very playful and silly girl. I love her temperament and personality, well, except for maybe one thing. Groovy loves life so much that often times when she is called to come in from outside, she will not want to come in because she would rather stay outside and play. It was sort of cute when she was 6 months old to see her little wheels turning like “Ummmm….do I have to? I REALLY want to stay out here and play!” She’d dance around with her ears perked and eyes alert and wide. Then, I would have to walk out and get her…sometimes even chase her. Now, at a year old, she still stands outside when it is time to come in, but she stands real still with a pitiful look of “Awww….I was having so much fun and now it’s over! !” I still have to walk out to get her, only this time I do not have to chase her. She knows she will not win this “stand off”. I scoop her up, I cradle her in my arms, I give her smooches, and I assure her there will be more fun again later. She kisses back. Obedience to the Lord is often a rough road to walk….at first. Early on, in our immaturity (or perhaps ignorance), we disobey God by backing away from Him and holding tight to that which we think we so badly want or need in life. We cling to our “moment”, we try to justify why we should be free to enjoy our “moment”, and we fight to keep our “moment”. When we mature a bit more, we begin to obey because we know God is the Authority…but, we still don’t like it and we still don’t understand why God has put a “restriction” on our personal freedoms. While it is good we obeyed, we have not yet moved into obeying from the heart…which is what God is really after. Why? Because when we get to the point where we obey from the heart, we are at a point where there is no “fighting”, but rather peace and joy. There is peace in not always having to understand the complete wisdom in what God asks of us through simply trusting that God is good, that His love is great, and that He has our best interest at heart. And, there is joy…joy because we know our obedience is pleasing to Him. Where are we on our road to complete surrender to God and His will and His ways? My girl “Groovy” has traveled the rocky road to now the gravel road, but I am sure she’ll be cruising down that smooth, paved road very soon….especially when she realizes there is a free flowing stream of doggy biscuits awaiting her around that next bend. Perhaps God has our fondest delights and dreams awaiting us around the next bend on our journey? I suspect He does….if we will obey from our heart….and go there. The great Book of Psalms starts right off in Chapter 1 verse 1,“Blessed is the man who does not walk in the counsel of the wicked or stand in the way of sinners or sit in the seat of mockers.” Sounds pretty and poetic, doesn’t it? But do we heed its practical advice? When we search for direction, for what to do, or for what to think on a matter, who do we ask? When we know something is wrong and we do it anyway because “everyone else is doing it”, what path are we traveling down and with what company? Do we sit by while injustice occurs and even join in on the contempt of the “weak”? Sarcasm and ridicule can often be quite contagious. If we watch carefully who we walk, stand, and sit around, we are told we can be blessed. Blessed….defined in the Greek as “happy, prosperous, fortunate, and enviable”. What a promise! But, we’ll never see that promise until we choose to follow God, to keep company with Him, and to seek to surround ourselves with those who will lift us up, not bring us down. I am not losing “Hope”…she and “Groovy” have taken a momentary “detour” down a dead end path. But, they still have the grand matriarch “Joy” to help keep them in line and to give them something positive to imitate. “Joy” is as blessed as any dog can be blessed...and I am blessed to keep her company. "So he returned home to his father. And while he was still a long way off, his father saw him coming. Filled with love and compassion, he ran to his son, embraced him, and kissed him. His son said to him, ‘Father, I have sinned against both heaven and you, and I am no longer worthy of being called your son.’ But his father said to the servants, ‘Quick! Bring the finest robe in the house and put it on him. Get a ring for his finger and sandals for his feet. And kill the calf we have been fattening. We must celebrate with a feast, for this son of mine was dead and has now returned to life. He was lost, but now he is found.’ So the party began." I have a rescue English Cocker here right now named “Whiskey”. Whiskey was found wandering the streets of a Chicago suburb. He was so fat he looked like a whiskey barrel with legs, hence his name. Whiskey was pretty scruffy when he was found…dirty, matted, in need of serious grooming. I groomed him up with the help of a friend and underneath all that curly, matted fur was a beautiful boy! With the support of the English Cocker Spaniel Club of America (ECSCA), the national breed club of which I am a member, Whiskey was treated by a vet for a severe bronchial infection and he is now recovering here at “Golden Gait”, surrounded by all his new friends. Whiskey is happy to be clean, fed, cared for, and loved….but you know what? I think I am just as blessed to have had the opportunity to give, to love, and to help a soul that was lost….and now is found. What joy it brings me to think I was able to play even a small part in helping to “save” his life. We don’t know the circumstances surrounding how Whiskey got lost. Perhaps he had irresponsible owners. Or, maybe he finally figured out a way to escape his yard so he could chase that cat! (Whiskey is a big time cat chaser). No matter the reason, the fact still remains he was lost…and in need of rescue. Sometimes I think we too get “lost”…sometimes on purpose, sometimes through circumstances which seem out of our control. We wander about, looking for “home”…empty, hurting, hungry…hungry not for food, but for love. We often try to fill this void with all the world seems to offer, only to discover we are left unsatisfied still…empty, wounded, and searching again. There is one who sees our wanderings, who sees our emptiness, who sees our pain…he is our heavenly Father who yearns deeply to “rescue us”. The parable of the prodigal son told by Jesus shows us a Father who saw his son while he was “still a long way off” and he delighted at his son’s return home. He didn’t care where the son had been or what he had done, but only that his son was home. The Father’s desire was to shower his son with blessings and affection and love, for his son was lost and now was found! How great was the Father’s love! Do you need rescue? Do you feel lost? God doesn’t care how you got where you are….whether it was of your own doing or through circumstances out of your control. No matter the reason, God desires to rescue you and to welcome you home. God is not the evil “dog catcher” in the sky who wants to put a noose around your neck and lead you away to “jail”. No, God is as Jesus described Him…the Father who sees you from still a long way off, who feels love and compassion for you, who wishes to run to you, to embrace you, to kiss you and to care for you. If you can see God like this, you are probably more likely to “come when you are called”….and to be rescued yourself….like Mr. Whiskey Barrel. I was recruited recently to help with a couple English Cocker rescue dogs. Now, I needed one more dog activity like I needed a hole in my head. Somehow, though, I made the time to help out. First, there was “Fritz”, the 9 year old dog who just needed a special someone to not be turned off by his age, but rather to see the gentle old soul with a lot of love to give. Then there was “Whiskey”, the red dog found lost, wandering the streets of Chicago. I wrote about Whiskey in my last article, “In Need of Rescue”. It took a lot of time and effort by a lot of people, but both Fritz the senior and Whiskey the lost have happy endings….we eventually found them forever loving homes. 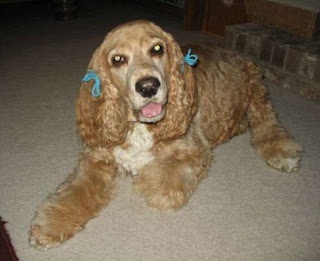 I, like many of my peers in our national breed club, The English CockerSpaniel Club of America, regularly donate money to support rescue efforts. And, money IS needed. However, this time…this time I went beyond donating my pocketbook. For two months I helped get Whiskey cleaned up, trimmed down, and back to health. I grew quite fond of this big love bug! During the same two months, I helped screen homes for Fritz, trying to remain hopeful that someone was going to come through for him. After arranging a quite complicated transfer of Fritz to what we thought was a good fitting home, it was only a week later that the new owner called to return him because he was “too big”. The day I got this news was the same day I delivered Whiskey to his new home. My heart sank, and I had an emotional “meltdown”. I really loved this Whiskey dog, but what if this new person didn’t? What if Whiskey is returned next week too? So much time and energy and emotion had been poured into these dogs and now my heart broke for them. My heart broke for THEM….such sweet boys who just needed someone to love them, for someone they could love in return. Rescue was so much easier when I could just write a check. When I first volunteered to help with Fritz and Whiskey, I was reminded of James 1:27. I thought, “Yes, as a responsible English Cocker breeder, I should help take responsibility for the widows (senior dogs) and the orphans (lost dogs) of my breed.” So, I showed myself responsible, and I donated not just my money but my time to help with Fritz and Whiskey. But, it wasn’t until that one day, the one day I was getting Fritz back all while sending Whiskey off, that I experienced the true meaning of James 1:27. In my tears, the Lord spoke to my heart, “I want more than your time and your money and your responsibility…I want your heart”. I asked, “Why? It hurts to give my heart!”. He answered, “Because if I have your heart, I have you not just for Fritz and Whiskey, but I have you forever…for all I wish to save”. He made His point…He had my heart. James understood this heart of God when he wrote “Pure and undefiled religion before God and the Father is this: to visit orphans and widows in their trouble…” To visit…in their trouble. Sometimes it takes us that trip to the trenches experience in order for God’s heart to become our heart. Sometimes it takes us saving one life before our heart aches to save many. Sometimes it takes risking hurt and loss before we can save the hurt and lost. Sometimes it takes us going beyond responsibility, beyond time, beyond money to see that all our “religious charity” is not what God needs most. He needs our heart. A senior Fritz and an orphan Whiskey taught me that….two rescues…who rescued my heart. "But blessed are your eyes, because they see; and your ears, because they hear." My old girl, Glory, will be 15 in another couple months. That's 105 in doggy years. She is pretty much blind and deaf now. Her hips are stiff, her body is frail, and her breath couldn't be helped by a gallon of Listerine. Still, I love every stinky, wobbly, deaf and blind ounce of her. She lay here sleeping beside me right now, snoring away, peaceful as ever. Bedtime is the highlight of our day together. I crawl in to bed, assume the "spoon" position, and "Tiny Tot" (as I call her) wriggles her way into that nook of my belly and rests her dear head right where I can get a good whiff of that sweet breath of hers. I don't mind….it's Tot's breath, and nothing else in the world smells quite like it. Her days are pretty much spent sleeping now. But, when she awakes, she looks around (as best she can with no vision) and she immediately knows whether she is resting at my feet or whether she needs to seek them out again. Maybe my feet smell something like her breath does to me? Either way, she is content as long as she knows she is near me. I am her light and her peace in her dark and silent world…and I am more than happy to be everything she needs me to be. I think sometimes we can feel like we are alone, walking out life in darkness and silence. Where is God we ask? Why am I going through everything I am going through? Does He hear me? Does He see me? Does He know I am in pain? Does He care at all? I think most of us have been there at one time or another…that cold, dark place where we feel God has abandoned us. Are the feelings real? Are the struggles real? Yes. But, there is a Truth that transcends even our "reality"…God's Word and promise. Jesus promised us in John 8:12, "I am the light of the world, he who follows me will not walk in darkness, but he will have the light of life". Jesus promised us again in John 10:27, "My sheep hear my voice, and I know them, and they follow me". Jesus is our light. Jesus is the voice calling out to us. The light is there for us to follow. The voice is there for us to follow. But, are we ready to follow? Perhaps if we were, we would see the light…and hear the voice….because they are there for us…He is there for us. Jesus is our light and our peace in this often dark and silent world…and He is more than happy to be everything we need him to be. Glory may be blind and deaf now, but she still follows me wherever I go. She seeks me out…my smell, my touch, my warmth. I am her peace….I always have been….even when she could see me with her eyes and hear my voice with her ears. Nothing has changed really. We're both just a little older….and perhaps just a little more stinky. "Trust in the Lord with all your heart, and lean not on your own understanding. In all your ways acknowledge Him, and He shall direct your paths. " Not 5 minutes down the road, my one and a half year old Hope girl begins to “quiver” and her memory is jogged as to the last road trip.“Oh, I feel nauseous. This road is bumpy. What have I done? Are we there yet, Mom?” Two year old Groovy lasts a little longer and then smashes her pitiful little face against the crate door and stares at me.“Mom, can I come out of this crate and sit on your lap? I’d really feel much safer in your arms. Please? Oh, and are we there yet?” Joy…well, she’s been on enough of these “rides”. She fixes her bed just so and hunkers down for the long haul. She has learned time goes faster when you sleep and let Mom drive. With a little extra consoling, the 3 girls settle in and rest....for a while. Every couple hours, the “Are we there yet?” routine repeats. Hope sits up, quivers and shakes, whines, and then wonders why in the world she wanted to go on this road trip to begin with. Groovy gives her pitiful pout and then begs and pleads for release from her “prison” so she can see where we are going. Joy…well, she just sighs and returns to her sleeping…she has long surrendered to the fact that it is best to just let Mom drive. Sometimes when God invites us on a journey, it isn’t just the destination He is concerned with, but also the journey to the destination. Can we trust the Master? Do we let Him “drive”, or do we critique and complain and play the part of the annoying back seat driver? Do we whine the whole ride because the journey is taking too long or is too bumpy and is making us nauseous? If we can’t “see out the window”, can we still trust that our Master knows where He’s going and will get us there safely and “on time”? My old girl, Joy, she knows me well. She trusts me. She knows how to rest and let me drive. The ride might be bumpy, it might be long, but she chooses to join me on the journey anyway…wherever it leads. Sometimes it is to the vet’s office….not always “pleasant”, but still necessary for her well being. Sometimes though, like this time, it is for a week long “camping trip” with Mom at a hotel. What could be more great than kicking back with Mom, eating bon bons, playing with toys, chewing on bones, and sleeping on the bed for an entire week?! Lord, let me learn a lesson from Joy. You know where you want to take me, when you want me to get there, and what you want me to see or learn along the way. You are the driver, you are my driver. I will trust you on this journey, no matter the twists, turns, and bumps. I choose to have joy in the journey because you are with me…and there’s no other place I’d rather be than with you.